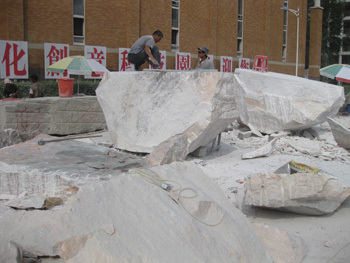 Given the scale of the blocks of stone we sculptors are dealing with the organisers of the Symposium enlisted the assistance of artisans with experience working with stone. 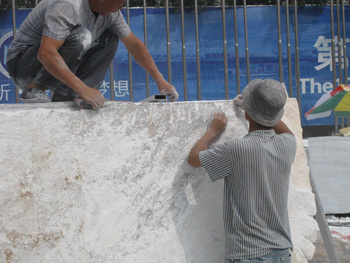 I have been supplied with 2 large block of ‘red’ marble (apparently not as hard as the white marble) and 2 assistants. The work undertaken was to smooth off the two faces of the blocks so that one could sit flush on top of the other. This is pains taking work particularly when done with hand held flush-face 9″ diamond cutting blades. Work was slow and I requested more assistants. Over the past few days a team of 3 artisans have removed a vast amount of excess rock and resurfaced the smooth faces of the blocks to ensure the best possible fit. My role at this stage is to direct the work rather than do it; in other words hands off. This situation will change as the stone takes on a shape closer to the form of the finished sculpture. At present I am enjoying watching how each sculptors’ work is progressing.Each day I become more familiar with the processes involved with making large sculptures in stone, metal and bronze. The energy at the work site is terrific. 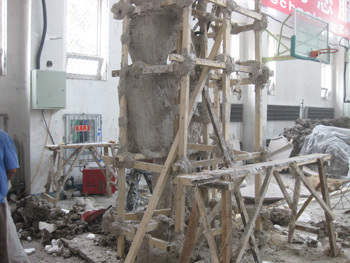 However,the air is often filled with stone dust and fumes generated by welding and fibre-glass resin used in mold making. It pays to wear a proper mask, glasses and ear-plugs to lessen the impact of this industrial environment. Thea Tini from the World’s smallest Republic, San Marino Italy, has enlisted my help to develop and promote a Project aimed at building on past experience and the energy here in Changchun to sow the seeds for a State of Art world wide! We hope to present this Project as part of the up-coming International Sculpture Symposium to be held in Changchun in September.